I am originally from Mansfield, MA, a small town about halfway between Boston, MA and Providence, RI. I first learned to knit when I was 8 years old. I learned by watching the lady (Madeleine Valente) next door knit. The first item I remember knitting was a simple doll. The pattern was from Child’s Book of Knitting by Edith Jay (a Christmas gift from my parents and currently available to borrow from OpenLibrary). I have a vague memory of the doll sitting on a mantle at the Foxboro State Hospital. My Girl Scout troup was visiting with institutionalized children. A little girl took a liking to the doll and it was given to her. My next item (that I remember) was a baby sweater I knitted for my nephew. 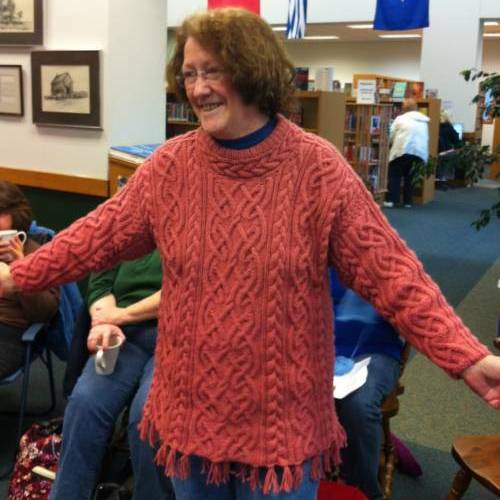 The fine ladies at the Yarn Shoppe in Mansfield helped me with that sweater through three weeks during the summer and patiently answered all of my questions. Without them, I would not be the knitter I am today. Please do not ask me to teach you to knit. I am not good at showing people the basics: casting on, the knit stitch and the purl stitch. Once the individuals know the mechanics of those basics, I enjoy helping novice and experienced knitters with their knitting problems and showing them different ways to accomplish various tasks. I began this web site as a vehicle to share a few patterns I wrote. I do not sell my patterns; I give them away. I have benefited from free patterns on the Internet so it is a small way for me to pay it forward. Also, I do not care if a person makes money by selling an item created with one of my patterns. If someone wants something special, such as a chart, I ask the person to donate at least $10 to the USO. The Errata page was added in September 2011 because I was so tired of finding errors in patterns and not finding the errata for them. Pattern writing is not easy but when a person pays for a pattern, he or she should have an expectation of accuracy. I created a carrot from Amigurumi Knits and could tell that the pattern was wrong when my carrot was fatter than the rabbit in the picture. A search of the Internet (including Ravelry) yielded only that “the pattern has an error” and no corrected directions, so I figured it out and posted it in the hope that someone who has this same problem might stumble across the correction. I expanded the page to add suggestions to make knitting some patterns easier or the finished results a bit more polished. Why include a Crochet page on a knitting web site? My friend, who reviewed the web site for me and made suggestions, said he did not think it fit the mission of this site. Well, in my humble opinion, every Knitter should know how to crochet. Not knowing how to crochet limits the Knitter in what he or she can create. I began putting my patterns on Ravelry because my friend, Meg, reminded me that people who download patterns often upload pictures of their projects to Ravelry and link them with the original pattern. By putting my patterns on Ravelry I will see what some people are doing with them. You can find me on Ravelry, DeborahKnits. My newly-designed web site is courtesy of Toni Toland, one of my knitting buddies and a designer. I help her with knitting and she did a total redesign. Something tells me I got the best part of this deal. You can visit her Etsy shop, TolandDesign, for original, handcrafted stitch markers. I hope everyone who visits this site finds something useful. And please share with me your links, tips and suggestions. We Knitters can help change the world in a small way, one stitch at a time. Please email Deborah at DeborahKnits@gmail.com with your tips, links and suggestions.